It is a tragedy of unparalleled sadness, brutality, and horror. On Wednesday, October 22, 2014, Abed a-Rahman a-Shaludi, a resident of the village of Silwad, with a history of security offenses and ties to Hamas, viciously rammed his car into the crowded Ammunition Hill station of the light rail in Jerusalem. Among those hit by the vehicle was a stroller with three-month-old Chaya Zisel Braun sitting in it. The baby, who was an American citizen, was thrown several meters into the air, landing headfirst on the pavement. She tragically died of intracranial bleeding. Several other people at the station were injured. Chaya was born to her parents after years of trying to have a baby. Her grandfather explained that they had just taken her that very day on her first trip to the Kotel, such a joyous occasion. They took beautiful photos of her there. On the way home from the Kotel, their entire world changed. As our delegation from Chabad’s Terror Victims Project (CTVP) arrived at the shiva house of Chaya’s family, our hearts ached for the parents and all the family whose anguish and pain were visible in their eyes and on their faces. We spoke softly to them of a special poster campaign CTVP has launched in memory of their precious daughter, called Add Light. The family was very deeply moved by this. Through their tears, they asked that we encourage as many people as possible to take part in this campaign. And they asked us to thank everyone who does so and thereby helps to bring more light into the world after the darkness of their daughter’s death. 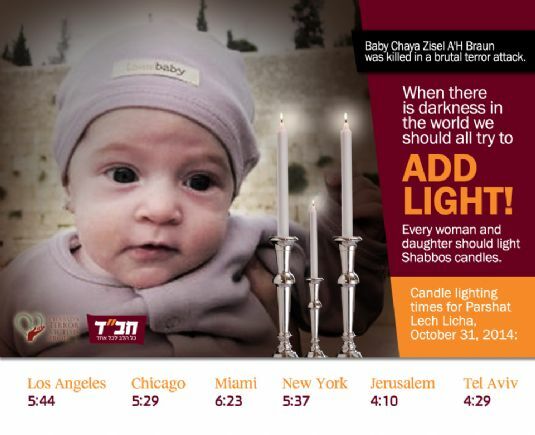 Rabbi Yosef Aronov, Chairman of Chabad of Israel, said that this campaign is vitally important, both to increase the memory of this precious baby girl, and to bring more light into the world with the Rebbe's Mivtza of Neshek.